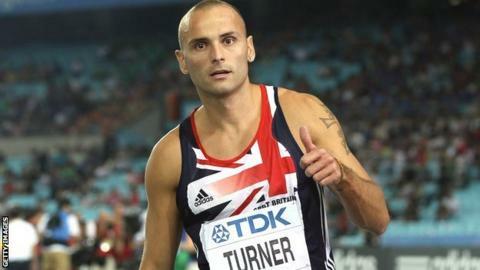 Hurdler Andy Turner says his selection for a third Olympic Games is a huge relief after an indifferent season. The Nottinghamshire star has struggled for form this year and missed out on an automatic spot in the 110m hurdles after finishing third in the trials, but he was still named in the squad. "It's a big weight off my mind," Turner, 31, told BBC Radio Nottingham. "I was worried for a little bit but I got the nod so I am going to try to get myself in the best shape possible." Turner, who won a bronze medal at the last World Championships, added: "Because I have had a few problems this year and my form hasn't been as good as the last couple of years, it has been really stressful. "But I have got the nod, that is all that matters. I will be at London 2012 and I cannot wait. Turner won his first major titles in 2010, clinching European and Commonwealth gold. His success came just two years after UK Athletics withdrew his lottery funding because he was "too old to improve his PB or to make a major final". His funding was restored in 2009. "I had a few niggles along the way and I thought maybe this year I was going to be jinxed because every Olympic year seems to be a bit jinxed. "I was getting a bit worried that I had ridden my luck for the last few years and it had maybe run out." The Hucknall hurdler decided to change his training regime this season by heading to Florida instead of having his normal warm-weather training in March but admitted it was a mistake. "Potentially it could have made a big difference but it didn't work," Turner said. "You have to take risks in order to make the next step. It didn't pay off but it was still a good trip and I enjoyed it. "I have gone back to what I normally do and hopefully I can find my form again. "I'm racing at Crystal Palace next week and that will probably be my last race. I will go to Portugal for some last-minute training and really get sharp there."